We are all familiar with Nazis burning books or the censorship imposed by communist regimes but book banning also takes place in the USA, the UK and Western Europe. We may be able to understand (if not approve of) the banning or challenging of some books but even a cursory inspection of a list of banned books will raise eyebrows. A quick question for you – what do the following books all have in common? Harry Potter, Twilight, the Grapes of Wrath, Anne Frank’s Diary and James and the Giant Peach? Yes, that’s right. They have all been banned in various parts of the western world. I find myself at a total loss to see why we should be barred from reading any of these books. If they can be banned or challenged in free societies, how much worse must it be under authoritarian regimes? If books such as those listed above can be banned under benign government, what would happen if we wound up with a government that was hostile to freedom of expression? Our enjoyment of the freedom to read and to express ourselves cannot be taken lightly or for granted. We may be able to laugh at the silliness of the Colorado librarian who locked away Charlie and the Chocolate Factory or the weirdness of the Hunanese provincial government for banning Alice in Wonderland but what happens when governments ban books that are critical of them or church groups can have books banned that do not conform to their strictures? We need to celebrate our freedoms so that we do not forget how important they are to us. 1984 by George Orwell. This book has the distinction of having been banned in the Soviet Union for being anti-communist and having been challenged in Florida for being pro-communist. Go figure. Brave New World by Aldous Huxley. This was banned by the Irish government for its depictions of sexual promiscuity and drug taking. As the novel was trying to warn of the possible consequences of these activities, they seem slightly to have missed the point. Metamorphosis by Franz Kafka. A book about a man turning into a cockroach. Seems harmless enough, right? Not really. It was banned in the Soviet Union. For being depressing. Unlike the USSR. Or maybe not. It also managed to get banned in Nazi Germany to complete a special Double. Alice in Wonderland by Lewis Carroll. What on earth could get this children’s story banned? Well, the Cheshire Cat and the White Rabbit managed to have the book banned in Hunan, China in 1931 for the crime of having talking animals. How dangerous. Fiesta: the Sun Also Rises by Ernest Hemingway. Banned in Boston and Ireland, this book is included to represent all those books burned by the Nazis in the 1930s. the Hobbit by J.R.R. Tolkien. Burned in New Mexico in 2001 for being satanic and banned by other US school districts. Bilbo Baggins aka Lucifer? Hmmm. Not sure about that one. Fahrenheit 451. Ironic really. 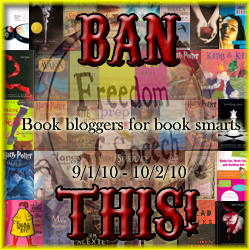 The book deals with the implications to society of banning books. And then was itself banned in parts of the USA. Really, you couldn’t make it up. Check back here regularly to see how I get on! Hi Rich, in my usual organised fashion I have logged all of the books I have read since landing on the big island in Jan and have just finished my 47th! Sammy, I did something similar last year and listed every book I read in the back of a notebook! Hope the move goes well and I will certainly bear your suggestions in mind (except maybe Twilight - I am irrationally prejudiced against it! ).